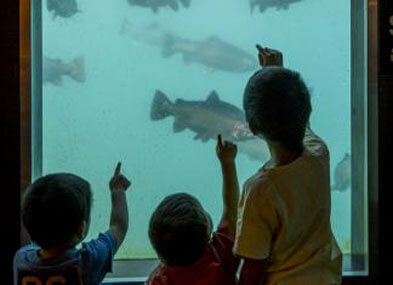 Queenstown Underwater Observatory – fun for the whole family! Home / Our Stories / Queenstown / Queenstown Underwater Observatory – fun for the whole family! 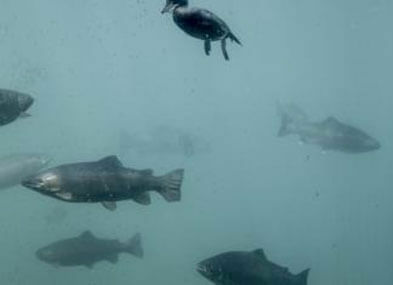 Queenstown’s only Underwater Observatory gets up close and personal with the local wildlife in Lake Wakatipu. You will come across some of the biggest trout and salmon you have ever seen, with some weighing up to 20lbs. Take a look at the New Zealand Long Finned Eel as it slithers around outside the windows. A highlight for most is New Zealand’s only true diving duck, the Scaup Duck. Feed the fish for only a $1, sit back and watch the frenzy as the fish and ducks eat. Many people are surprised to find out that there is no enclosure around Underwater Observatory, the fish and eels you see are free to come and go and usually stay as they get fed regularly. One question we get asked time and time again in Underwater Observatory is “Is the glass magnified?” most are shocked to discover that it’s not. The fish outside are well fed and with no fishing allowed inside Queenstown Bay, you can find some pretty impressive sized trout swimming about. The trout can weigh anything from 2kg to 10kg (3lbs to 20lbs). The New Zealand long finned is native to the lake unlike the trout and salmon which were introduced and you will only find this particular eel in New Zealand. Outside Underwater Observatory you will mainly see females. The female eels are the larger of the two and can weigh up to 25kg (55lbs). The NZ long finned eel can live up to 90 years and is one of three freshwater eels. These eels will spend their whole lives in freshwater and will only travel once to the ocean to spawn and then die. The kids will love to watch the eels slink about in front of the windows and feast upon the mince that is put in the eel feeder each morning. The favourite amongst most are the diving ducks, Scaup Duck or New Zealand Black Teal. They are small ducks but appear silver underneath the water due to air trapped in their feathers. They can dive up to dive 8 metres and can stay underwater for 45 seconds. The Scaup Duck is a protected native New Zealand bird.